Why is Health Research Important to Me? 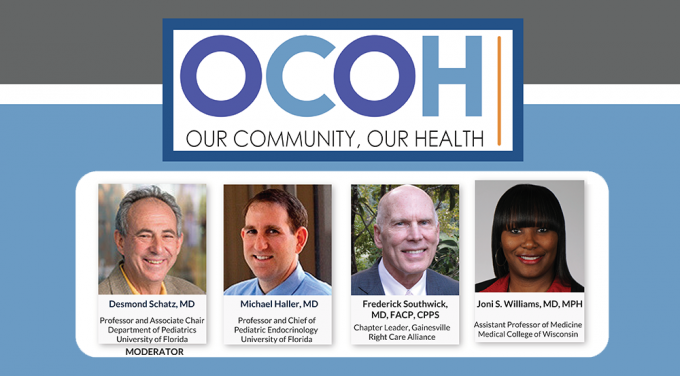 On Thursday, November 29th, UF HealthStreet hosted a town hall meeting about how diabetes has become a worldwide epidemic. The interactive forum was livestreamed, allowing both in-person and online audience members to have their questions answered by the panel of experts. Desmond Schatz, M.D., medical director of the UF Diabetes Institute, moderated the town hall and began the conversation by telling the audience that diabetes is the epidemic of the 21st century. He emphasized this point by contrasting the number of people who had diabetes in 1980 against the number of people who have diabetes today, highlighting that the number hasn’t just doubled, but quadrupled. Schatz also pointed out that between 20-25 percent of all healthcare dollars go to the treatment of diabetes and diabetic complications, yet very little is being spent on diabetes research. He said that Florida was at the center of the diabetes epidemic, where out of a population of 20 million, more than 7.5 million people either have diabetes or prediabetes. Schatz then turned the focus to the cost of insulin, which he said has skyrocketed inappropriately and then turned the conversation over to Dr. Frederick Southwick, internal medicine internist at the University of Florida and chapter leader for the Right Care Alliance. Southwick explained that as an internal medicine internist he frequently works in the hospital wards and over the past 3-4 years has seen a spike in the number of people suffering from diabetic ketoacidosis due to rationing or going without insulin. He said that studies show that 1-in-4 outpatients admit to rationing their insulin due to its high cost and highlighted a study at Emory University, where 17 percent of patients being admitted to an intensive care unit with diabetic ketoacidosis could not afford their insulin. Southwick gave a brief history of insulin prices starting in the early 1920s when the Eli Lilly pharmaceutical company bought the original patent for $1, to the present day, where insulin costs $26,000 a liter. (See the infographic for details). Southwick stated that there are only 3 manufacturers of insulin and that they have all shadow-priced throughout each pricing era. He pointed out that while it now costs patients $275 for a single vial of insulin, that same vial only costs $10 to manufacture. He talked about the fact that a number of 26-year-old Americans have died after getting off of their parents’ insurance because they couldn’t afford their insulin. Haller stated that the Right Care Alliance supports patients with diabetes and is organizing to bring awareness to these issues. The next panelist to speak was Dr. Joni Williams whose team provides clinical care for diabetes but also conducts clinical research working with marginalized, underserved populations to improve diabetes outcomes. Williams spoke about the importance of research to help reduce disparities in both care and outcomes. She said that the particular focus of her team was on developing clinical trials in collaboration with the community to address specific needs. Much of the focus of their research is on behavioral studies where they teach patients how small lifestyle interventions can lead to better health outcomes. These studies provide education and skills training–either in person, online or over the phone–for a 12-week period. The education sessions ensure that patients are adhering to their medications, improving their exercise levels, and making healthier choices with their diet. Williams said that they are beginning to see that both types of lifestyle interventions are improving outcomes, whether a technology-based or a home-based intervention (where a clinician works with an individual on a personalized level). They are seeing improvements in A1C, a marker used to detect how well patients have controlled their insulin levels over a 3-month period, as well as improvements in secondary outcomes such as blood pressure, improvements in self-care behaviors and lifestyle behaviors and overall improvements in quality of life. Dr. Michael Haller continued the conversation on disparities and how patients with financial or geographical barriers are often unable to see the sub-specialists who are trained to help them manage their diabetes. But he pointed out that almost everyone has access to some type of primary-care doctor, whether that be through the Health Department or through a private practice. Haller explained that there is a group that has been proposing that the way to solve the access problem for sub-specialty care is to train primary-care doctors to be more expert-level in their ability to take care of folks with Type 1 diabetes. The idea was developed into a program called ECHO (Extension for Community Health Outcomes) which was first used in New Mexico to address a Hepatitis C outbreak that had gotten out of control because there were not enough gastroenterologists to treat all of the patients. They created a network where, rather than providing direct-to-patient telemedicine, they were providing tele-education to primary-care doctors and teaching them how to do basic Hepatitis C therapy. And within a short period of time, they were touching hundreds of thousands of lives because they had created a huge network of patients and providers. Haller is part of a team that is now modeling this with Type 1 diabetes. They have partnered with Stanford University to create diabetes-specific ECHO programs in Florida and California. His team has now been delivering weekly “tele-education sessions” to doctors at 15 clinics throughout Florida and the same thing is happening in California. Haller says the primary-care doctors are incredibly invested and really want to do a better job of taking care of patients with Type I diabetes. Haller ended by saying that we all have to work together to create systems that are patient-centered and provide meaningful outcomes. He said that each year we spend more and more money on Type 1 and Type 2 diabetes yet each year outcomes are getting worse and worse. Can diabetes be cured with diet? Can you talk about the reasons for the rising number of people with diabetes? Are there ways to get reduced prices on insulin? If we don’t have insurance, what do we do? Are there alternatives to insulin? Do herbs help? Watch the livestream to see how they answered these and other questions.